SELLERSBURG, Ind. (CNS) — As the rosary was prayed aloud, 16-year-old Rebecca Reynolds knelt with her parents and three siblings near the altar of St. Paul Church in Sellersburg. Her eyes were turned upward toward the illumined statue of Mary. It was not just any statue that Rebecca and her family venerated. It was the traveling pilgrim statue of Our Lady of Fatima, a twin to the statue at the shrine in Fatima, Portugal, where Mary appeared six times to three shepherd children in 1917. It is one of two statues commissioned in 1947 with the purpose of bringing the message of Fatima to the world. It was blessed in 1947 by the bishop of Fatima, and later by Pope Pius XII. It has been traveling for almost 70 years. In the Archdiocese of Indianapolis, the statue visited St. Michael Parish in Brookville Aug. 18-20, and St. Paul Church of St. John Paul II Parish in Sellersburg Aug. 21. Rebecca and her family are members of St. John Paul II Parish. They visited St. Paul specifically to see the traveling pilgrim statue. Charles Whittaker, a fourth-degree Knight of Columbus, processed into the church with the statue. He said it was an honor to participate in the event. When asked about the statue, Father Thomas Clegg, pastor of St. John Paul II Parish, said it was “a great honor” to host it, and gave credit to parishioner Phyllis Burkholder for making the statue’s visit possible. “I think people are really thrilled about seeing her. You can see that in their expressions and in their piety, praying before Our Lady,” she said. 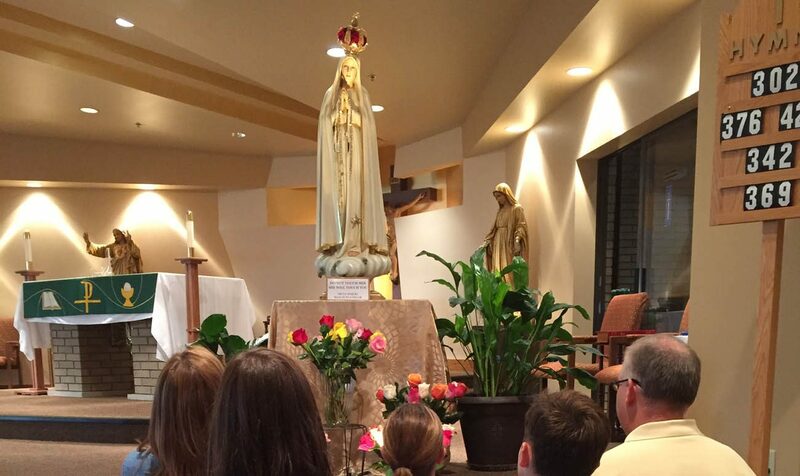 Such prayer is precisely what Our Lady of Fatima called for, said Sabat during a talk he gave in the church. “On the 13th of every month between May and October (in 1917), she held up the rosary and said to pray it every day,” he said. “Every time we have a problem? No, every day. Every week? No, every day. Every 13th day? No, every day. “Eight days later, she came to Fatima,” Sabat said. But the message Mary declared was not just for the people of Portugal, nor just for the circumstances of that time, he explained. Turning to Jesus through Mary will result in peace, said Sabat. “Those simple requests for prayer, penance and conversion, our consecration to her Immaculate Heart, to save souls, is the most important thing to do today to bring about the peace she promised,” he said.